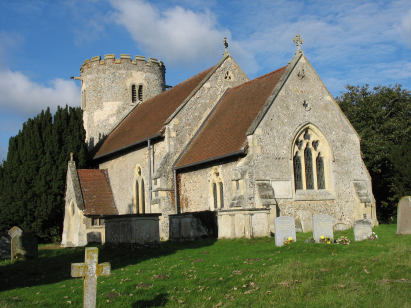 The parish of Kilverstone lies in southwestern Norfolk on the border with neighbouring Suffolk. Kilverstone lies about 2 miles northeast of the market town of Thetford and just east of the former route of the A11 road which connects Thetford with Norwich. There's very little to Kilverstone except its eponymous Hall and a lot of forestry land. The parish is located on the poor soils of Norfolk's Breckland and these were unsuitable for arable agriculture, the parish does possess some better soils in the flood plain of the River Thet which forms its southern boundary and these would have been used for cattle. The majority of the land, at the time of this transcript, would have been left to sheep run or warrenries. The parish was sparsely populated and this has not changed much although Thetford is today creeping ever closer. St Andrew's church sits adjacent to Kilverstone Hall and is accessed by a narrow track south of the main lane that runs through the parish. 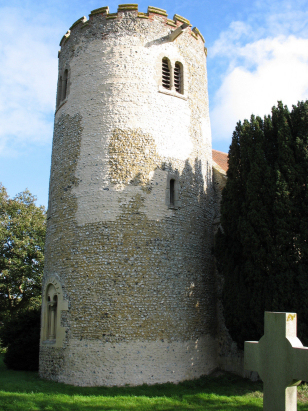 The age of St Andrew's is immediately given away by its round tower. Typically indicative of an early church St Andrew's round tower has Norman style windows and 12th century belfry windows which place the building as one of the elder churches of Norfolk. Pevsner also dates the south doorway as Norman but much else dates from the Perpendicular period typical of Norfolk's churches. The building stands in attractive grounds with many mature conifers some of which hug the walls of the church, it is a very peaceful spot. A single standard 800-entry register covers not only the period of this transcript but, indicative of the low population, also runs onwards to the late 20th century. This register is filmed on Microfilm MF1681 in the collection of the Norfolk Record Office which was used to prepare this transcript. The film is one of the recent ones and benefits from the improved techniques available today. The images are crisp and clear, a definite boon when at times the register is rather scruffily kept. As a result this was a straightforward piece to prepare and it is hoped few errors will have crept in.